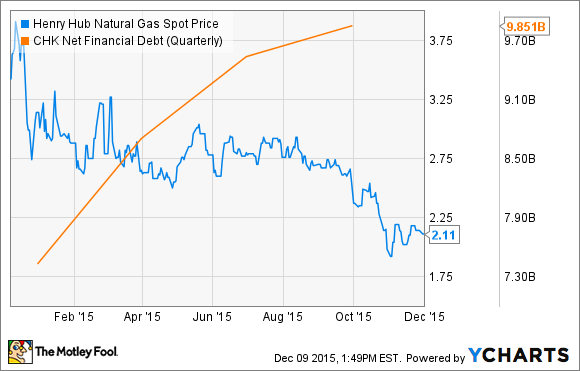 The natural gas driller made some bad moves this year, but these are the worst. With its stock price down by more than 75% by early December, it's clear Chesapeake Energy (NYSE:CHK) made some poor choices in 2015. Here's a look back at some of the worse moves it made in 2015. In late February, Chesapeake Energy released its 2015 capital expenditures plan. At that time the company anticipated spending $4 billion to $4.5 billion, which while 26% less than it spent in the prior year, was still expected to raise its adjusted production to 645,000 to 655,000 barrels of oil equivalent per day (BOE/d), or 3%-5% over the prior year. Investors and analysts, however, widely panned the plan because it would result in the company maintaining its practice of outspending its cash flow while at the same time growing production into an oversupplied market. Now to be fair, Chesapeake wasn't the only gas driller to put out a growth-focused capex plan for 2015. Top-five gas producer Southwestern Energy (NYSE:SWN) only reduced its spending plan by 17% over its 2014 level, which it expected to drive a 23% surge in its natural gas production over 2014 levels. That said, Southwestern Energy's plan was still expected to enable the company to live within cash flow. It didn't take Chesapeake long to realize that its initial budget was too high. About a month later it put out a revised plan, lopping $500 million off of its budget and bringing it into a range of $3.5 billion to $4 billion, which would result in 1% to 3% production growth. The problem with that revision was that it really didn't solve the company's growing cash flow problems. Further, growing production into an oversaturated oil and gas market only contributed to the supply problems. That's why the company's next move was probably the epitome of bad moves. Thanks to improved well performance through July, Chesapeake Energy's production was trending higher than expected. So much so, the company increased its production growth guidance by 4% at the midpoint, or to 667,000 to 677,000 BOE/d, all while maintaining its spending level in that $3.5 billion to $4 billion range. That would be great news if it wasn't for the fact the market was oversaturated with oil and gas, which was pushing prices lower and widening the company's gap between capex and cash flow. In other words, growth for the sake of growth was back in style at Chesapeake. Worse yet, the company basically refused to back down on this plan when it reported results in November. Instead, it pushed its production growth target up again, this time to 670,000 to 680,000 BOE/d thanks to continued strong well results. Oddly enough, it did so even after lopping off another $100 million from its capex budget, bringing that down to a range of $3.4 billion to $3.9 billion. While Southwestern Energy took the same path by boosting its production guidance in July and at the same time slightly reducing capex spending, that doesn't mean it was the right path for Chesapeake to follow given its tighter financial constraints. Henry Hub Natural Gas Spot Price data by YCharts. In hindsight, Chesapeake Energy should have initially cut its capex to the point where it balanced with cash flow, even if that resulted in declining production. This would have saved the company from burning through $2 billion cash, which has led to a significantly deteriorating financial position. The hope is that the company learned its lesson this year, and will embrace fiscal discipline in 2016 and beyond because its pursuit of growth has never paid off and it's running this company into the ground.